Before you watch the video below let me tell you that we only had one take. That said, please pardon the mistakes both in question making and grammar, the redundancies, and the nervousness as it is my first ever recorded interview as well. If you think I sucked, I promise to do it better next time. If you think it wasn’t bad for a first time, send me your bank account number NOW! 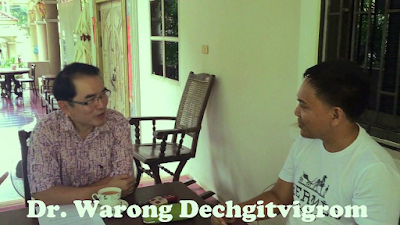 This isn’t my first time to interview Dr. Warong. Back in 2012, I had the chance to interview him. However, he was uncomfortable when asked if it was possible to record our conversation at that time. He let me to put what we talked about in writing, though. You can see the script of the interview from the blue link below. Hear everything about the “English For All” and his liking for Filipino teachers from the very person who started everything. The same man who defended Filipino teachers before the recruitment started. Ladies and gentlemen, Dr. Warong Dechgitvigrom. Next Next post: Vice President Leni to receive Thai honor TODAY!